I apologise for gushing, but this looks absolutely amazing! I can hardly wait to try it out. 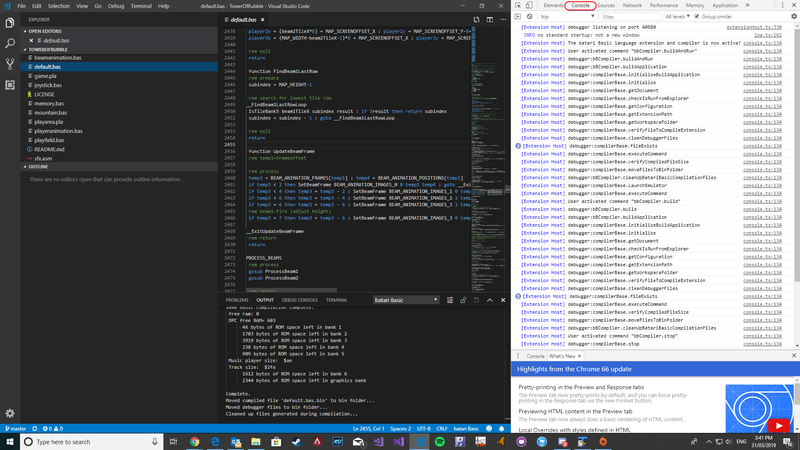 This extension will be a lightend version compared to vbB as a number of the good external tools probably just can't be included due to the focus on VS Code being a specific coding environment and also being cross-platform it just doesn't offer the ability do UI stuff. I may be able to throw open a document with an html document but that's about it. I certainly share you concern about accessing these tools but you can run each as required. Thanks! Coding in a good environment is a really important requirement to enjoying your dev time. Hopefully soon I'll make it available! I use VS nearly every day also so it's something that's familiar and enjoyable to use. I may be able to throw open a document with an html document but that's about it. Pretty impressive editor! I've been using the AlienBill one (https://alienbill.co...yerpalnext.html) which I adjusted to include a few more frames but this one is very feature rich! I need to investigate just what is possible to show in these tabs. 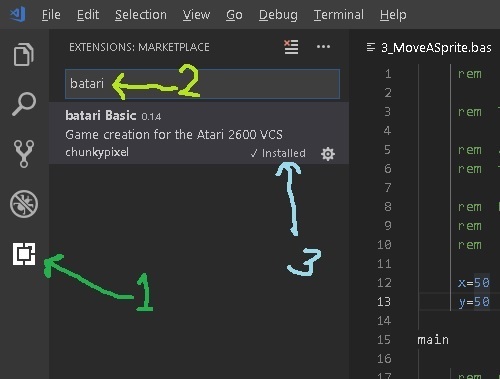 The first release of the extension is now available and can be installed directly from within VS Code (via the marketplace) - see the first post for more details. Special thanks to Stephen Anthony for allowing Stella to be included along with the extension. Thanks Tony, hopefully we might be able to add a few things down the track to help out but will see how it goes. Let me know if you have any suggestions/feedback! I just tried this out, is stella suppose to pop-up when you choose compile and run in emulator? It doesn't for me, the only two settings I changed was the path to the bB compiler folder and the path to stella.exe, do I need to setup something more? If you clear both those can you compile and run Stella? Also does the output window appear for batari Basic? 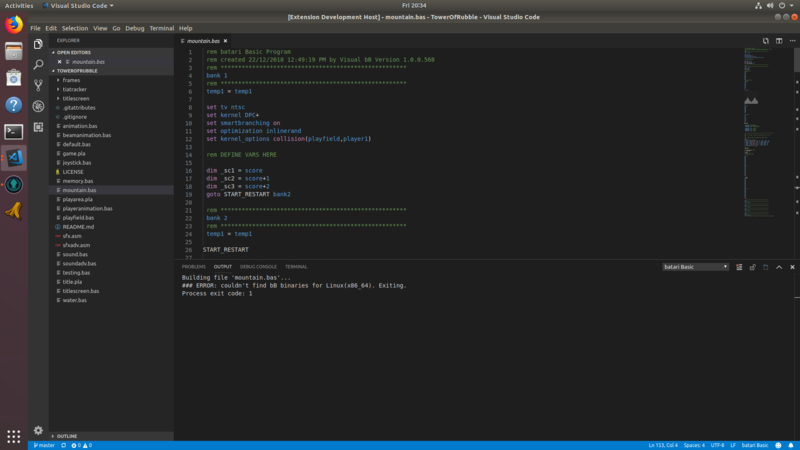 It logs the compile and execution of the program and Stella. I do have another user who cannot do this currently but I have yet to determine why - trying to work out whether there is some sort of log file that might show what is happening. Edited by mksmith, Wed Mar 27, 2019 3:19 PM. Sometimes stella doesn't open for me in visual bB either, I think it's when i use åäö in the filename or somewhere in the bas, but I've tried other peoples code to. I got the same message with exit code: 1 when clearing both fields. Edited by Lillapojkenpåön, Thu Mar 28, 2019 2:53 PM. Ah thanks - perhaps that might be it! I'll do some checking around spaces and hopefully that will fix these issues. Stella launching might also be affected by the same sort of issues. Update: Spacing is working for me during debugging. 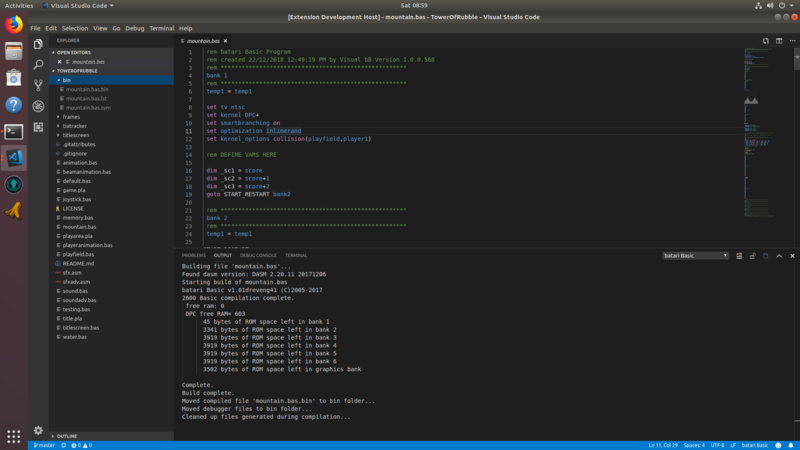 Looking at the code the error 1 is stopping any further continuation of the process. I'll PM you. Edited by mksmith, Fri Mar 29, 2019 9:05 PM. This output displays each step called by the code and may assist in debugging any issues that arise. Thanks to TwentySixHundred and Lillapojkenpåön for helping with a couple of compiler/launcher problems. I should be able to now move forward and start looking at cross-platform and additional features. Edited by mksmith, Mon Apr 1, 2019 4:07 PM. Spaces in filenames are evil! Seriously though, this is a problem that continuously pops up over the years, since what's a nice naming for people often causes problems for the computer. Good to hear that you fixed it. 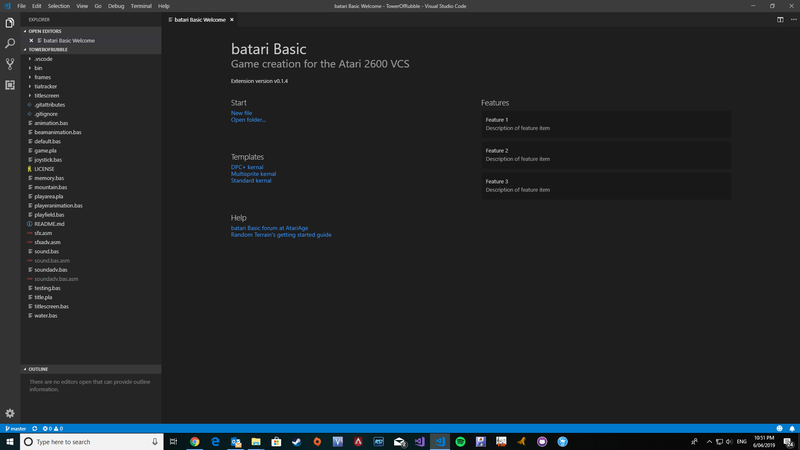 Made a start on a batari Basic Welcome page that you can open to help do some of the base stuff you need. It's a bit convoluted to get scripts, styling etc due security requirements (bit of head scratching!!) but managed to finally get the basics done here to capture clicks and respond back to VS Code to do stuff like open files, folder, website etc. Now to add some styling and additional stuff. Hoping I can set this to auto-open (optional) when starting VS Code but not sure if it's possible as you need to do something (ie. compile) before this side of the extension activates. Anyway will see! Edited by mksmith, Sat Apr 6, 2019 6:07 AM. Make sure you restart VS Code after installing. Thanks for adding the pic (I've addeded to the main post!). I need to work out how to include images in the read me page so I can incorporate something more visual like this. Edited by mksmith, Thu Apr 11, 2019 2:54 AM. It looks like I've managed to work through most of command line issue such as PATH and bB configuration - and I've also had to manually override the permissions on 2600basic.sh with chmod 777 (not sure how that will work rolled out via an update). ### ERROR: couldn't find bB binaries for Linux(x86_64). Exiting. Any help on how this might work would be appreciated!!! Edited by mksmith, Fri Apr 12, 2019 5:36 AM. 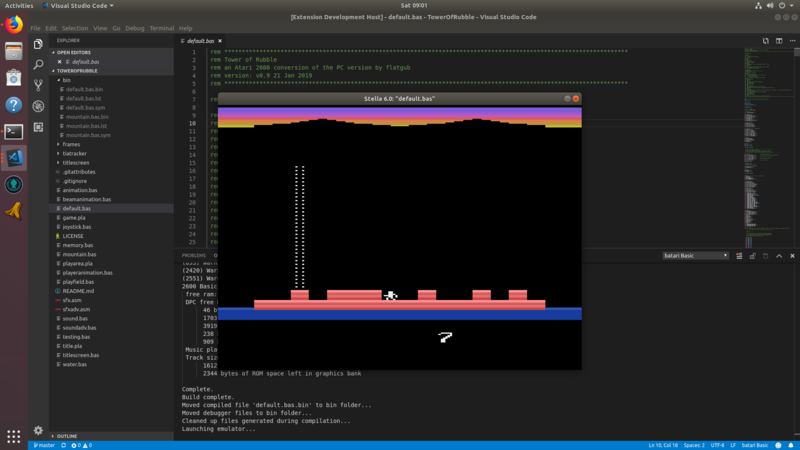 The 2600basic.sh script will try to use x86_64 binaries if the plain X86 binaries aren't found or aren't able to successfully run. I'm thinking the 32-bit compatibility libraries aren't present on your system. Try the following: "sudo apt-get install ia32-libs" and see if it gets you further. Now to launch Stella! Success! Edited by mksmith, Fri Apr 12, 2019 5:03 PM.